A sample cell, prepared for a media tour. 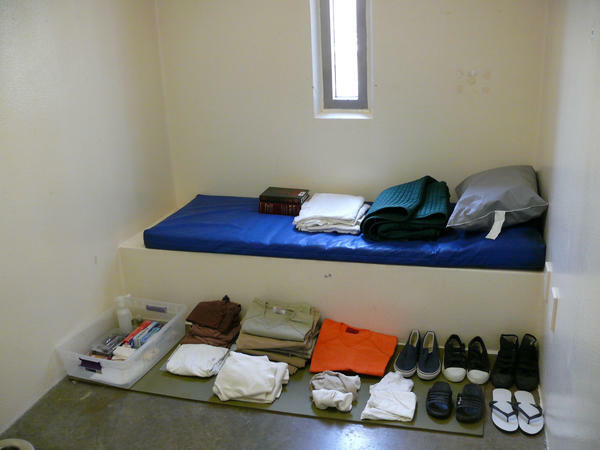 The items displayed are intended to represent the typical belongings a detainee is allowed to keep. The Camp 5 TV room includes a comfortable chair, with padded leg restraints, where a compliant detainee could watch multiple channels and DVDs. 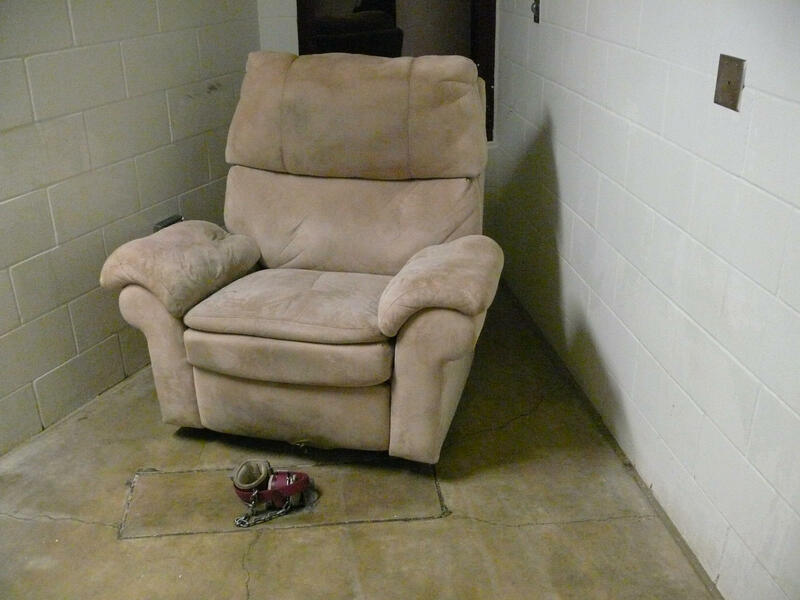 The construction of Camp 5 at the detention facility in Guantanamo Bay back in 2003 was taken as a sign that the prison was there to stay — "evolving from wire mesh to concrete," as reporter Charlie Savage wrote then in The Miami Herald. But today, because of a shrinking detainee population, Camp 5 is a thing of the past. "Camp 5 at Guantanamo Bay has been closed as a detention facility and re-purposed into another function and the detainees consolidated," according to Navy Capt. John Filostrat, a public affairs officer with Joint Task Force GTMO. "Parts of Camp 5 will be converted to a detainee medical clinic to improve operations." Camp 5 was where "non-compliant" detainees were held, isolated in individual cells. One guard who has served multiple tours at the facility — we are not allowed to identify them by name — told me that relations between guards and prisoners were better than he'd ever seen. He attributed that in part to greater cultural sensitivity on the part of guards. The remaining inmates from Camp 5 have been transferred to the more open Camp 6, where some inmates live communally and grow their own food. Capt. Filostrat told reporters that all the detainees are now "compliant." The Obama administration has picked up the pace of transfers in recent weeks, and President Obama reaffirmed his desire to make good on his promise to close the detention facility before he leaves office. "As we continue to shrink the population to the point where we're looking at 40 or 50 people and are maintaining a multimillion-dollar operation to house these people, the American people are asking why should we spend this money on this when it could be spent on other things," Obama said in a press conference in Laos. But the president has been unable to find a way to work with Congress to transfer the dangerous and 'high value' detainees kept in the highly secretive Camp 7 — including Khalid Sheikh Mohammed, the accused mastermind of the Sept. 11 attacks. And for now, the military commissions at Guantanamo are continuing to plan for hearings in the trials of Mohammed and six other detainees.